Marco Sara is a young Friulano producer whose family and 7 hectares of vines and 4 hectares of woods are located just north of Udine at Savorgnano del Torre, on the western of the Colli Orientali del Friuli – a pre-Alps range of hills that separate Friuli from Slovenia. Here, at between 75 – 300 msl, the marne (‘ponca’) and sandstone slopes favour Marco Sara’s white and red indigenous grape varieties Friulano, Ribolla Gialla, Picolit, Verduzzo, Schioppettino, Refosco, along with some Cabernet Franc. Marco took over the reins of his family cantina in 2000, making the switch from selling off in bulk to bottling the fruit himself. In 2005 the estate became organic; it was also the year when he first bottled sweet wines Picolit and Verduzzo. 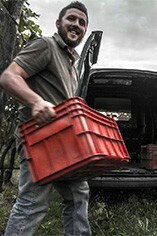 He makes small quantities of hand-made wine, using organic fruit and wild yeast. These are authentic fine wines that speak of an indigenous grape, that respect and reflect local tradition and territory.